Dr. Reynante E. Autida, Director for Research Development and Evaluation Center (RDEC), gave a discussion on Integrating Quantitative Methodologies in Research. The WMSU Library headed by the University Librarian Dr. Benhur A. Asid and his staff spearheaded the MASTSLiNet Seminar-Workshop and General Assembly last May 24-26, 2017 at the Grand Astoria Hotel, this city. The seminar banners the theme: “Laying the Foundations for Change: the Internationalization of State Libraries in the Academe in Mindanao”. MASTSLiNet, which stands for Mindanao Association of State Tertiary Schools Library Network, is a library networking and a resource-sharing group among members of Mindanao Association of Tertiary Schools (MASTS). 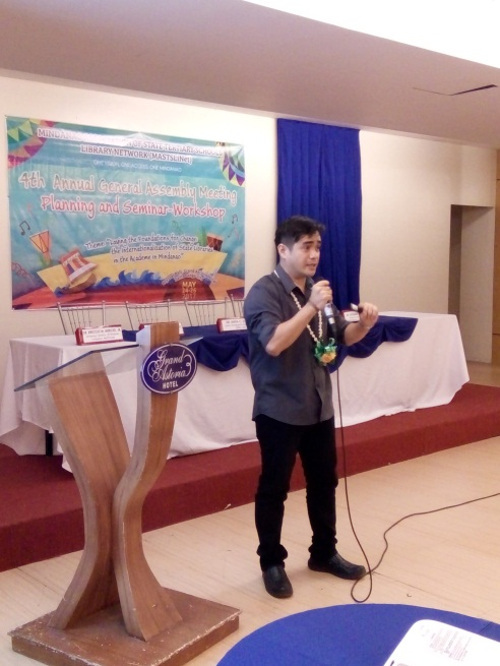 The three-day event was attended by more than 50 participants from various State Universities and Colleges (SUCs) in Mindanao. Several topics were discussed, to include: ISO Requirements and Documentation, The Choreography of Qualitative Research Design, and the MASTSLiNet Journal: Basics of Writing Styles and Formats for International Publications. The discussion enabled the participants to craft research topics for MASTSLiNet Publication and know more about documenting procedures on ISO when it comes to library practices. Dr. Reynante E. Autida, Director for Research Development and Evaluation Center (RDEC) also served as a resource speaker. He lectured on Integrating Quantitative Methodologies in Research. During the general assembly, Dr. Benhur A. Asid was elected president of MASTSLiNet. He will serve from 2017-2019.